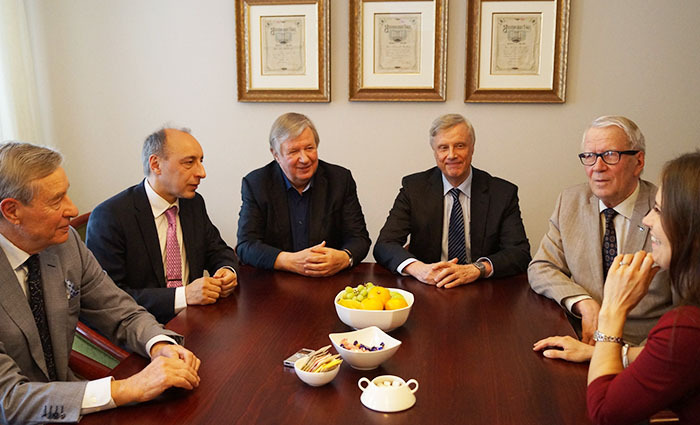 Sari Lounasmeri, President and CEO of the Finnish Foundation for Share Promotion, convened a number of senior investors to discuss the market situation. We are witnessing the third longest rise in hundred years of the SP 500 index that measures the performance of the United States equity market. What should a private investor make of this? The Finnish high-end investors do not need much introduction: present are Seppo Saario, Tomi Salo, Jarmo Leppiniemi, Jarl Waltonen and Erkki Sinkko. This group of experts is worth listening to, since in addition to their command of theory and technical analysis, they also, and above all, have a wealth of experience in share investments from several decades. There are several signs of rapidly increasing interest in savings in shares in Europe and also in Finland. Lounasmeri wonders whether we should be worried or excited about the fact that investing as such appears increasingly often in the headlines. Salo opens the discussion by noting that the masses have finally become active. He considers this a sign that the final push is about to commence as far as the rise is concerned. “I am waiting for the summers sales to start, as has happened during the five previous summers. Maybe the downswing has already started. The dividend money will then come to good use”, says Sinkko. “The rise of the US SP 500 index has been ongoing for six years already, and the uptrend is set to continue. No real corrective movement has yet occurred. In November, the stock prices fell for about three weeks, and the purchasing rush was immense, as finally there was a momentary sale after so many years”, says Salo. A strong rise was witnessed in the Helsinki Stock Exchange OMX Helsinki index early this year. According to Waltonen, the increase is independent of the fundaments. With fundaments he means the company’s performance, balance sheet, market capitalisation and the relationships between them. When the European Central Bank (ECB) started quantitative easing, the stock prices jumped. What interests Leppiniemi in all this is that the rise was so great precisely when the purchasing of government bonds started. “This serves as an indication of the fact that the markets are not all that effective. Information about the commencement of the easing was available well in advance, and the decision had also been made,” says Leppiniemi. The purchase of bonds will continue until ECB has attained its inflation target of slightly below two per cent. “A good question is if inflation can be caused by just throwing away money when there is no demand or investments”, Leppiniemi points out. To apply the brake or throttle? “Who buys when the prices fall and who when they rise? How do you determine the correct timing”, asks Lounasmeri. Waltonen takes the lead and speaks for all by saying that active traders are not easily found in this bunch. “So you never sell, but always just buy more. Is this a situation where the brakes should be applied?” comments Lounasmeri. Leppiniemi replies that it is always worthwhile to participate in the market. But there comes times when it is good to postpone the purchases. “I sell when I need money”. “The investors who do best are those who buy shares directly, diversify their portfolio and never sell,” says Saario. He refers to his book ‘Miten sijoitan pörssiosakkeisiin’ (How do I invest in listed shares? ), which some have even called the investing bible. Among other things, the book contains the golden rule that states that the stock prices always rise from November to April. “This year matches the statistics well. The phenomenon has 80% predictive accuracy,” says Saario. Sinkko points out that the OMX all-share index does not accommodate dividends like the gross index. For him, saving in shares is a shared hobby for his family, and shares can be bought regardless of the season. “There are always gems awaiting to be picked up, like Neo Industrial”, says Sinkko. In two days, he bought all the shares that were available for sale at 75–94 cents, and some accused him of false play. Sinkko states calmly that the price did not rise higher than that, after all. In Sweden, however, investors had to pay more than 3 euros a piece for the same shares. “In literature, this will later be known as the Sinkko bubble”, Leppiniemi quips. Lounasmeri ask the senior investors again if they had done any shopping. A short round reveals that the shopping carts appear to be quite modest. Salo’s most recent purchases were in September. Waltonen has bought some Nokia following the course decline. Waltonen praises Taaleritehdas and eQ as the most interesting companies in the Helsinki Stock Exchange. He considers them an attractive option for a private investor. “If I have bought something, I have also sold something”, Waltonen explains referring to the present balancing to and fro of his portfolio. In the middle of a lively conversation Waltonen throws a question in the air: which country’s stock exchange performed best during the early part of the year? Leppiniemi catches and gives the correct answer. It’s Russia – the country that declined most during the last year. The risk associated with Russia also daunts the experienced investors. If it materialises, there is no time to waste. Finnish households have tended to mostly keep their assets in real estate and deposits. Interest in share investments clearly exists, but the bare fact is that the number of private investors, in particular, is falling. There has been a lot of discussion of the significance of ‘popular capitalism’ in Finland. In reality, Finnish investors put their money in the bank even in the present financial situation instead of investing directly in companies by purchasing their shares or bonds, regardless of the fact that alternative investment objects are sparse at the prevailing zero-interest level. What is all this about, Lounasmeri asks the seasoned investors, considering that, on the other hand, the proportion of fund investors has increased? Is there some underlying market wisdom in this? Salo surmises if households have become more cautious as the share price performance of much praised companies like Nokia, Outokumpu and Talvivaara has been so poor. Leppiniemi thinks that underlying this development is simply the banks’ business. The banks’ customer service advisors who sell the funds have stringent performance targets, and when these are looked at, all that counts is the sales. “The funds are indeed good for the banks, but not for the investors”, Leppiniemi concludes. Sinkko, too, is put off by the banks’ tendency to push their own products. From the bank’s point of view, shares are bad in that they are transparent. “In Finland, the TER figures only comprise the fund costs; the trading costs are not stated”, Leppiniemi criticises. As the fund management companies are delivering good results, it would be worthwhile for the investors to purchase the shares of the banks that run them, the veterans conclude. The ongoing government negotiations inspire a heated discussion. Lounasmeri asks the veteran investors to send their regards to the new government. The veterans are infuriated by the fact that because of misguided decisions made, dividends are taxed twice. This is beginning to feel like a punishment and is unfair above all. The politicians are criticised for not knowing how to read the balance sheet and the income statement. The debaters also wonder why so few of them hold shares in listed companies. Some politicians have even stated in public that they consider the stock exchange a playground for those looking for quick returns. The original purpose of the stock exchange has clearly become blurred. By way of listing, companies obtain financing through other instruments than just share issues. A concrete suggestion for those engaged in the government negotiations is that small stock exchange dividends should be made tax exempt for their recipient. This would attract new people to invest their savings in shares. Salo points out that this would also be a gesture showing that the government appreciates the popular capitalism. During the past four years, the capital income tax rate has increased from the previous 28 per cent flat rate tax to a 30–33 per cent progressive tax. The taxation of stock exchange dividends has increased most. In 2011, the tax rate for stock exchange dividends was 19.6 per cent. Four years later, in 2015, the recipient pays a 25.5 to 28.1 per cent tax irrespective of the amount of the dividend. The stringent taxation of dividends specifically concerns stock exchange dividends. The Finnish taxation system is exceptional in that the taxation of dividends depends on whether the company is listed or not. Sinkko thinks that the separation of the company’s tax from the capital tax was a bad idea. The tax paid by the company has subsequently been lowered and the capital income tax increased. Lounasmeri points out that, in her opinion, the greatest problem of the present system is the threshold for listing posed by the taxation of dividends. Leppiniemi emphasises that support for small entrepreneurs is nevertheless important. Waltonen notes that young start-up entrepreneurs do not benefit from the present system that is tied to the net worth of assets. Instead, raising the lower limit for value added tax would be more beneficial for them. “The present model for the taxation of dividends favours old money, not new capital”, Waltonen sums up. Lounasmeri hopes that the taxation of dividends will be reformed so that companies could be listed while covered by the protection enjoyed by investors and made within the households’ reach without a taxation threshold. “The inclusion of the companies in the First North lists in the less stringent dividend taxation of non-listed companies would help as the first step to be taken if a comprehensive reform is not as yet seen as a viable option”, Lounasmeri surmises. The potential tax exemption of small stock exchange dividends and the dividend tax treatment of First North companies were included in the campaign promises of the parties presently engaged in the government negotiations.